The spikeless golf shoe is one of the most versatile pieces of kit that is making its rounds on the golf course. As they can be worn on and off the course, many golfers are actively choosing spikeless shoes due to how often they can be worn. Although spikeless varieties of golf shoes may seem like a compromise on style or functionality, this certainly isn’t the case. The spikeless golf shoe relies on innovative design and modern technology to provide just as great a grip and performance as their traditional counterparts. If you want to get more out of the golf course, without the hassle of having to change every time you leave, then you will certainly want to invest in some spikeless golf shoes. View the Best Spikeless Golf Shoes, Below. What Are Spikeless Golf Shoes? How long do Spikeless Golf Shoes Last? Who Introduced Spikeless Golf Shoes to the United States? We have researched the best brands, customer reviews, and modern features to find the top ten spikeless golf shoes for on and off the course. These spikeless golf shoes come from one of the best shoe brands in America so you can rest assured that quality is guaranteed. The rubber sole has great traction and can deliver balance and support when on the course, as well as being suitable for the clubhouse afterward. The great range of neutral shades ensures that there is a version of these spikeless golf shoes for every man. The insole has a yoga mat energy return, which is why it is incredibly comfortable, and the shoes will actually mold to your feet. The soft fabric lining is smooth and comfortable, making these spikeless golf shoes suitable for long term wear. These spikeless golf shoes are incredibly comfortable and supportive of your feet both on and off the course. This classic design shoe is based on the spiked version of the brand. They have a really unique and smart design, making them suitable for so many different occasions. These spikeless golf shoes are handcrafted from the finest materials to give them an unbeatable quality and style. The bootie membrane system makes these golf shoes incredibly easy to put on and off. 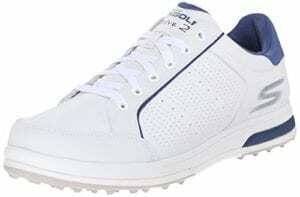 These spikeless golf shoes have a cushioned sock liner to increase their comfort and provide a snug fit, for better balance and control on the course. The anti-slip heel counter design is just as effective as the spiked counterparts. These spikeless golf shoes are incredibly attractive and practical, as they deliver unbeatable support and comfort on and off the course. These simple yet stylish spikeless golf shoes are water resistant, so they can be used in all weather climates. The cloud foam insole provides lightweight and incredibly comfortable support during and after the game. The outsole has a 6-spike thintech design that delivers long-lasting abrasion resistance and traction, making these spikeless golf shoes ideal for balance and support when on the course. These spikeless golf shoes have a specifically-designed wider forefront for better and more comfortable wear. The new and improved technology makes these golf shoes stable, comfortable and durable. These spikeless golf shoes have a great style and traction, to keep you comfortable and supported long-term. The adidas Men's Tech Response is a lightweight and breathable spikeless golf shoe that is incredibly comfortable to wear all day long. This comfort is maximized with the soft EVA insole that molds to the natural shape of your feet and supports the movement. The cushioning 6-spike thintech low-profile outer delivers great traction and support during the game. These classic sneaker-style spikeless golf shoes are just as effective for balance and support than traditional golf shoes but are more versatile to wear. They have a great size range to ensure that there is a fit for every man. These sneaker-style spikeless golf shoes are supportive, stable and deliver great balance with their thin and lightweight outsole. These spikeless golf shoes are incredibly attractive and practical. 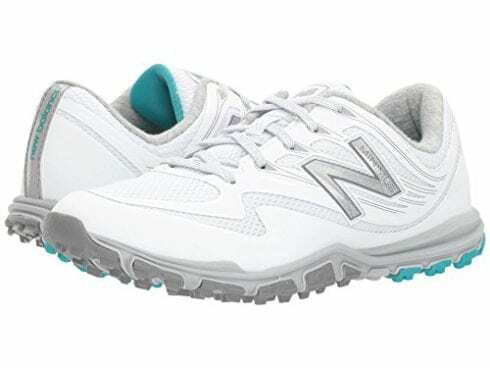 They are manufactured from a breathable mesh fabric that works to keep your feet cool and comfortable during the day. The synthetic sole has great traction to keep you balanced and secure when playing golf, as well as being suitable for various locations after the game. The yoga mat insole is incredibly comfortable and is manufactured to bounce back, so these golf shoes are suitable for repeated wear. There is a great range of color schemes available to suit every style or occasion. These attractive spikeless golf shoes are incredibly comfortable and suitable for long term wear both during and after a game of golf. These lace-up spikeless golf shoes feature an exclusive Climastorm water resistant outer, making them suitable for so many different locations and seasons. These flexible golf shoes are made from high-quality leather that is comfortable and suitable for a variety of different wearers. These spikeless golf shoes are incredibly comfortable as they are manufactured with a sock liner for a snug fit. These spikeless golf shoes also include an EVA foam footbed that molds to the natural shape of your feet to provide amazing support both on and off the course. They provide versatile wear, and their simple sneaker-style makes them suitable for a variety of occasions. These golf shoes are flexible, versatile and incredibly comfortable making them suitable for so many different seasons and occasions. The Callaway Men's Balboa Vent are incredibly comfortable, making them suitable for playing and walking around the course. As they are spikeless golf shoes, they are suitable for a range of locations while still offering great traction and support. They are made from a mesh and synthetic body that is breathable. Having breathable shoes when performing sports is super important as it will keep you cool and comfortable. The 5mm-EVA foam midsole molds to the natural shape of your foot to aid movement. These golfing shoes are lightweight, durable and flexible making them suitable for movement around the course. These spikeless golf shoes are practical, comfortable and flexible to keep your feet cool and supported throughout the game. These spikeless golf shoes for women are made from mesh and have a durable body. They are breathable, to keep your feet cool and comfortable when playing golf, as well as being flexible enough to be worn for other sporting events too. The rubber sole has great traction and can keep you supported on a range of terrains, both on and off the golf course. These golfing shoes feature an exclusive REVlite midsole with a 4mm drop to support the natural shape of your foot during and after movement. The range of colors available makes these spikeless golf shoes suitable for so many different women. These golf shoes keep your feet cool, dry and comfortable. These flexible and durable spikeless golf shoes are attractive and comfortable for a variety of different sporting occasions. 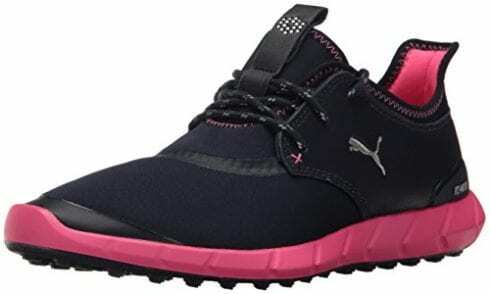 These PUMA Women's Ignite Spikeless Sport golf shoes are made from premium materials to deliver brilliant performance and support on and off the course. They are made from a waterproof leather and textile combination that is breathable and supportive. These spikeless golf shoes rely on premium and exclusive PUMA technology. The rubber sole has great traction and is thick enough to support your natural shape and movement. These spikeless golf shoes have an ignite foam insole that actually molds to the shape of your foot to deliver unbeatable comfortable support. These spikeless golf shoes are attractive and durable, as they can provide up to 1 year of waterproof protection. These spikeless golf shoes come from one of the best brands in the business, so you know the quality is guaranteed. They are a great value and fit true to size for a snug and supportive wear. These golf shoes are lined with a waterproof material to keep your feet dry and protect the quality of the shoes when on the course. They are simple in their design, making them ideal for various types of golfers. These spikeless golf shoes have a very sleek appearance and are lightweight. 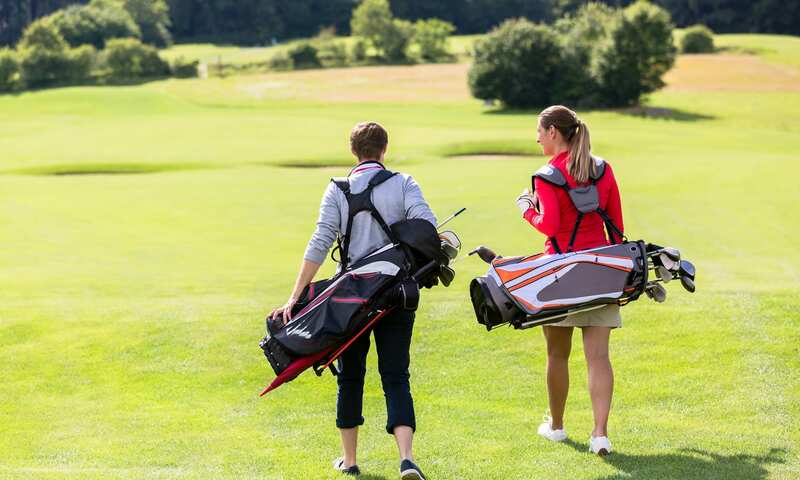 They are designed to keep you balanced and supported both on and off the golf course, which is how they are so versatile. These spikeless golf shoes are simple, sleek and lightweight while still offering great support and balance on and off the golf course. Spikeless golf shoes are not just for casual golfers but are also loved by professionals due to their comfort and versatility. Spikeless golf shoes offer stability, balance, and comfort both on and off the golf course which is why the market for them is increasing steadily. The low-key styling of these shoes makes them suitable for sporting events or the clubhouse. This kind of golf shoes can make such a difference to professionals and novices alike. As they are attractive and versatile, many people are seeking to find their perfect pair. The criteria for your spikeless golf shoes are certain to differ depending on where you golf, how often you golf and what your personal style is. As spikeless golf shoes have been made for one specific purpose, there are a variety of different qualities you should look out for. These qualities will determine how useful they will be to use on the course and therefore how often you’ll wear them. The materials that the spikeless golf shoes are made from will determine their durability, versatility, and comfort. Sometimes, the materials can also contribute to wear golf shoes are best suited. Depending on your needs and level of golfing ability, the materials you will be looking for will differ greatly. 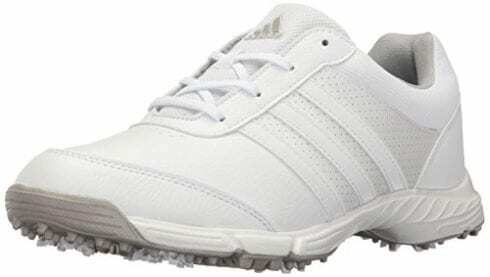 A lot of the spikeless golfing shoes throughout this review are made from leather and textile. 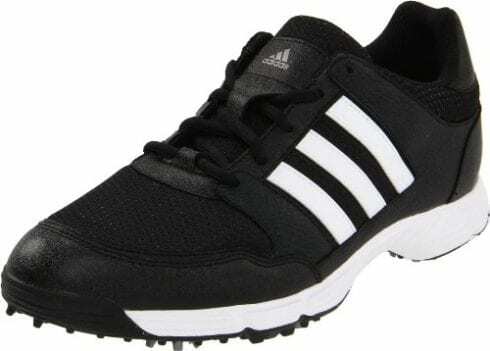 Shoes such as the Adidas Women’s W Tech Response and the Adidas Men’s Adicross V Golf are made primarily from leather. 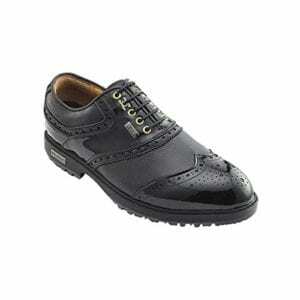 The leather is great material for spikeless golfing shoes as it is durable, tough and long-lasting. Leather golfing shoes are also more likely to be water resistant, making them suitable for a range of courses and seasons. Leather golf shoes may be less flexible than other shoes and may weigh more, as the material is more robust. Nonetheless, they are usually incredibly comfortable and will look good anywhere. This kind of spikeless golf shoes would be best suited to professionals in the sport. Another popular material for spikeless golfing shoes is mesh. 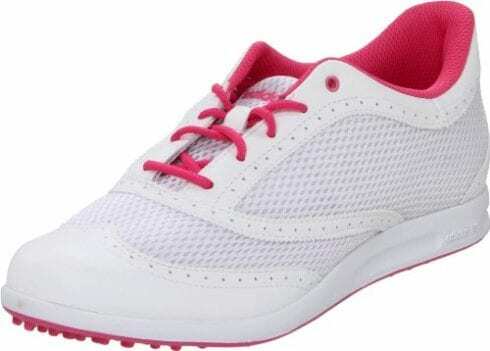 Shoes like Skechers Women’s Go Golf Birdie rely on the mesh as it is lightweight and breathable. 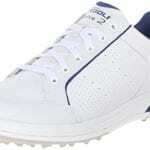 These kinds of spikeless golf shoes will keep your feet cool during golf games which will prevent any damage or strain. Mesh golf shoes are more flexible and are easier to transport. As they are lightweight, they may be better suited to casual golfers. Spiked golf shoes are renowned for their capability on grassy terrains. This is why they are so popular within the sport, as they can deliver great control and balance. However, golf shoes with spikes cannot be worn on the hard terrains which means that golfers will need to change at regular intervals. Spikeless golf shoes have been designed to deliver the same level of balance and support on the grass while being suitable for other terrains. It is this versatility that makes spikeless golf shoes an increasingly popular model. Although all of the golf shoes mentioned throughout this review can handle a variety of terrains, some may be better suited to your needs than others. Some shoes, such as the Stuburt 2016 Classic Tour Event Waterproof, deliver great traction on a variety of different terrains as well as being waterproof. Being waterproof means that this kind of spikeless golf shoe will provide a better grip on both grass and hard surfaces. Golf shoes are going to be worn for a long time. Golf is not a short game, so having a pair of spikeless golf shoes that are comfortable is vital. The more comfortable you feel, the better you are going to perform on the course. Although spiked golf shoes may provide extra security, especially when on soft and muddy terrains, they can be quite uncomfortable to wear. When wearing spiked golf shoes, you are always aware of the hard sole underneath you, and this can result in issues for those who already have problems with their feet. Spikeless golf shoes combat this problem by having a flat sole. Many models also include insoles and midsoles that are purely made for comfort. 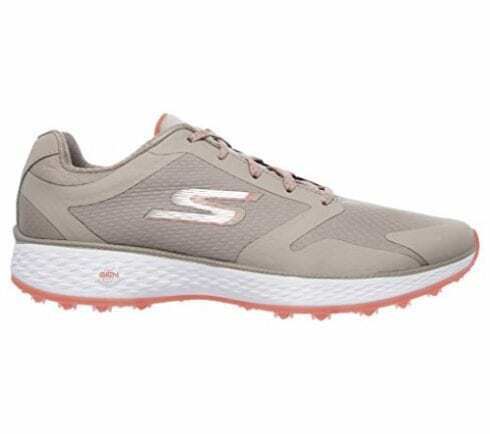 Spikeless golfing shoes like the New Balance Women’s Minimus Sport feature a specially designed midsole that will mold to the shape of your feet and support movement. This makes these kinds of shoes even more comfortable than their spiked counterparts, as they are flexible. Traditional with Spikes: Spiked golf shoes feature, as their names suggest, actual cleats on the outsole. These cleats are used to dig into the soft muddy terrains of the golf course to provide additional balance and support. These cleats or spikes are typically made from plastic, but they can also be made from metal. Spikeless Golf Shoes: Spikeless golf shoes are those that have a flat outsole. Spikeless golf shoes typically have a rubber outsole that has great traction and will feature dimples or bumps in replacement of spikes. Whether you have chosen the best spikeless golfing shoes for your needs or are still looking, chances are you have a lot of questions about this field. In order to help determine your decision, here follow some of the most popular questions asked about spikeless golf shoes. The lifespan of your spikeless golf shoes will be determined by how often you wear them and what kind of terrains they are being worn on. Although spikeless golf shoes are more lightweight than their spiked counterparts, as well as offering more flexibility, they are still incredibly durable. It is claimed that spikeless golf shoes, for the most part, can last for around 100 to 200 rounds of golf. As this is quite a vague amount, most people recommend replacing your spikeless golf shoes every three to five years. This great lifespan may differ if you wear your spikeless golf shoes more often. Due to the great range of golf shoes that are available, both spiked and spikeless, the reason why you might want to opt for the latter may still seem uncertain. A lot of people don’t like to stray away from tradition, making them apprehensive about spikeless golf shoes. However, this shouldn’t be the case. Spikeless golf shoes can be just as effective as spiked shoes but offer more benefits. The decision between spiked or spikeless golf shoes is largely down to the type of comfort you want, what personal preferences you hold and even what kind of golfer you are. Spikeless golf shoes are considered to be more versatile, due to the fact they can be used on all terrains and may even be used for other events. 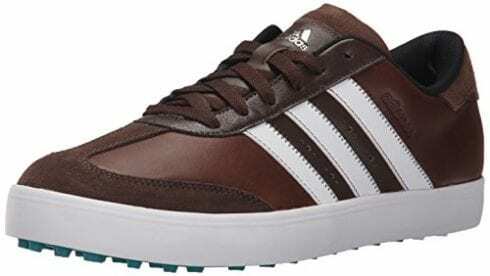 These kinds of golf shoes are also found to be more comfortable as they have a flat outsole. Spikeless golf shoes in the United States is actually a fairly modern adjustment to the sport. This kind of shoe really took off after the 2010 Masters, in which golfer Fred Couples was seen wearing a pair of Ecco Street Premieres. This was one of the first times a professional golfer had been seen wearing spikeless shoes during competition, and it certainly grabbed attention. Although spikeless golf shoes have long been favored in European and PGA tours, this was the first time that the US took notice. 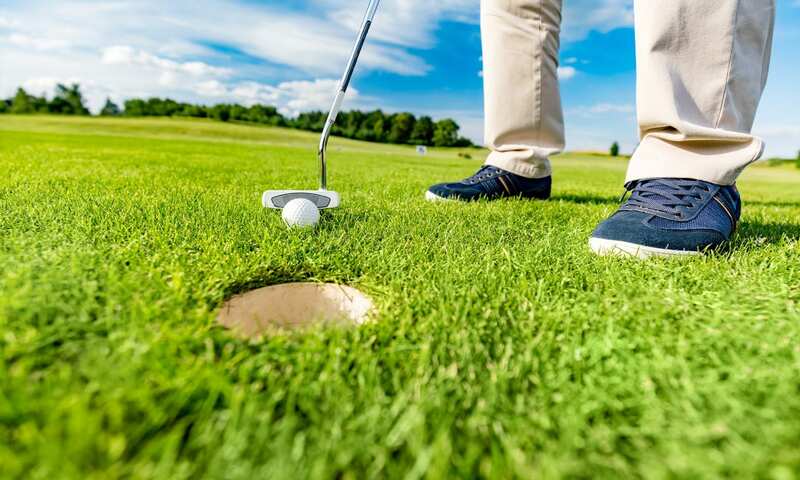 Spikeless golf shoes are typically worn for their comfort and seeing a professional in the sport like Couples choose this kind of shoe over a traditional pair made them more popular. Spikeless golf shoes are an increasingly popular market in the US. 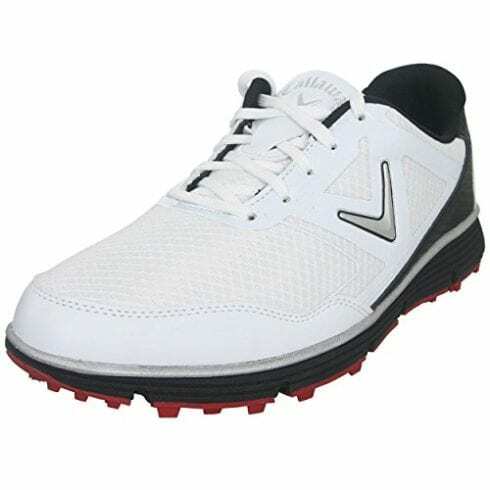 These kinds of golf shoes are typically favored due to how comfortable, lightweight and flexible they are. Spikeless golf shoes are also more versatile as they offer great traction on both soft grass and hard surfaces in golf courses. Replace your spikeless golf shoes after every 3-5 years of use to keep their quality and performance working well. The popularity of spikeless golf shoes in the US is down to professional golfer Fred Couples. We hope you enjoyed our article on "10 Best Spikeless Golf Shoes in 2019", if so, please share and rate it.